A wee photo album pairing insights and exhortations from young people with pictures of budding activists on the march. The photos are sandwiched between eloquent statements from Bob Bland, co-chair of the 2017 Women’s March on Washington, and Lynda Blackmon Lowery, who turned 15 marching with Dr. Martin Luther King Jr. to Selma. They feature individual children from preteens down to toddlers participating in recent protests. Most are carrying signs—some of which they plainly made themselves—conveying a range of slogans from pointed (“IMMIGRANTS: We Get THE JOB DONE”) to cute (“i [heart] naps but i STAY WOKE”). One sign is in Spanish, and throughout, both the children and the grown-ups around them are racially diverse. 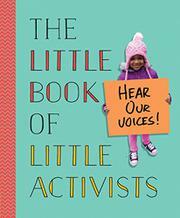 Along with simply phrased interpolations, such as definitions of “Activism” and “Democracy,” short quotes on the facing pages from writers 14 or younger, identified by first names only, range from affirmations of self and gender to anti-bullying sentiments and general urgings to be a change-maker. A teen’s cogent “Speak the truth, even if your voice shakes,” closes this well-knit call to action. A small portion of the proceeds will go to the Children’s Defense Fund.